There will be times when life becomes really grindy, the stresses unbearable. And that deep sense of helplessness … and self-pity … and rage … all at once gnaw their way into your soul, eating you up inside. You'd feel like it's your worst time yet, or so it would seem. While some of us may succumb to despair and never recover; there are those who can withstand their most difficult times and come through unscathed. 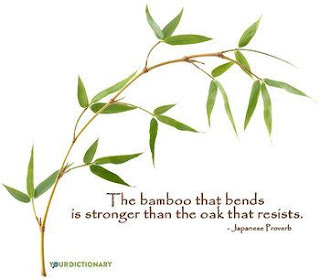 Like the lowly bamboos amidst the darkest storms, they bend but do not break. Stop taking (almost) everything personally. Realize that it's not always about you. Most of the times nothing others do or how they behave has anything to do with you or about you (personally). When you always take things personally, you are giving other people more power over you than they deserve or should ever be allowed. Instead, make it a habit to create a space between yourself and your reactions so you can more objectively evaluate the truth about any given situation or circumstance. Stop beating yourself up over (even the least of) your mistakes. We're living in a success-driven, celebrity-obsessed culture today and the pressure to succeed is so persistent that we cringe at the slightest hint of 'failure' coming our way. And there's that annoying voice inside of you berating you for every mistake or failure. This voice often gets the better of you. Because it's a crippling feeling to think that you're not good enough, you sulk and give up. Stop. Just stop, right now. Sure, we must acknowledge our failures and mistakes and correct the ones we can, BUT we must also let go of those we simply can't. Remember, "you" are only what you've got left when everything and everyone else fails (they eventualy will). So, love yourself despite your failures. Start each day with thoughts of gratitude and appreciation for everyday things. Gratitude is a necessary habit. It has the power to pull in a chain of good things into your life if you simply practice it everyday—in your thoughts, actions, and words. From that steaming cup of coffee you get to enjoy every morning to the safe ride home you get into at the end of the day …and everything in between —live it all with gratitude! Your life will be filled with so much positivity and lingering peace that it will be hard to break you down with even the hardest blow life can throw your way. Today, we're living in such a restless world with confusing values that it's become even harder to find one's own sense of meaning and purpose through it all. We'd get tossed and bent in every direction and means imaginable. Sometimes, life knocks us flat to the ground. But when you've learned to live life resiliently, you bend but do not break. Because you have the ability to accept all the punches and fireballs life hurls your way, you remain unfazed and holding steadfast to your values and sense of purpose no matter how worse it can get.